"Moses Webster was one of the finest Derby flower painters during the Bloor Derby years. 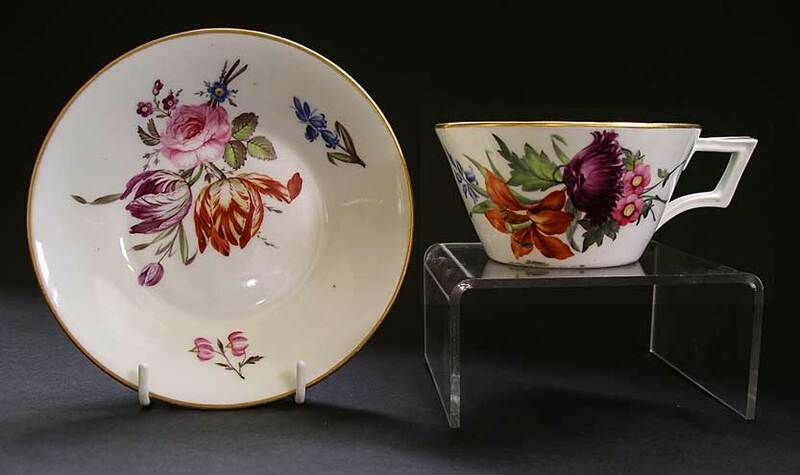 He excelled at the flower-decoration of best Regency English porcelain. This cabinet cup and saucer is too fine for cups of tea! 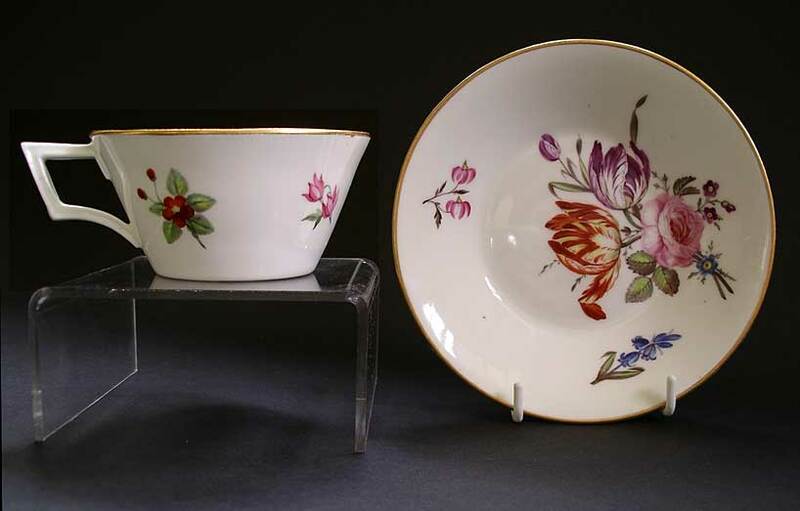 A wonderful example of Moses at his best: hand painted with two principal flower arrangements to cup and saucer with delightful subsidiary flower sprays to cup. A particularly exciting piece, for the discerning antiques collector, as Webster's work is more often encountered on plates and dishes." Antiques Expert Hamilton Bear. References: Pieces decorated by Webster are illustrated in most of the major works on Derby Porcelain. 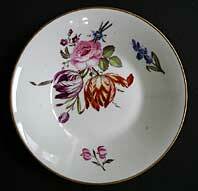 For example see, Derby Porcelain 1748-1848, An Illustrated Guide, John Twitchett (ACC 2002) Colour plate 61 page 111. Dimensions: width saucer 135 mm max. height cup 47 mm max. Marks: Derby Crown and cross batons with dots over D marks in iron red to both pieces, as illustrated below. Condition: a great display item, both pieces generally excellent including enamel decoration and original gilded rims. Condition report: To the cup there is some firing 'sooting/kiln speckling' to base/inside footrim and underside of handle. There are tiny specs of firing kiln grit to the glaze of the saucer (front). A very faint fine glaze cross-hairline to back of saucer. This is quite short and looks like crazing. Viewed under bright light with a magnifier: part only is only just visible on the front.